Vactek carries parts, hose, tubing fittings and maintenance items for mostall major brands of vacuum pumps. We have the most comprehensive of parts stock in the southeastern USA. Let us be your "parts stockroom." 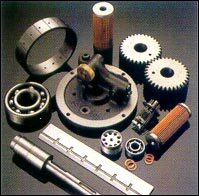 Vactek also specializes in hard to find and obsolete parts.There is no minimum order and most parts ship same day. We are 100% dedicated to maximizing your uptime.